"Launch-X Pro" - A time & space saver! Smartphones are smart! One of their biggest fortes is the ability to adapt (or to be adapted) to an individual user’s needs… and apps play a big role in this! There’s an app out there that can help you deal with every tiny issue and help make your day to day life easier. Aside from apps there are also more and more widgets to draw from; these handy little things not only help you personalize your applications, they also enable quick access to programs and information. Unfortunately, they often take a toll on the clarity of an app. "Launch-X Pro" sets out to help you with this issue. Read on and discover what the app’s really capable of. You can use "Launch-X Pro" to place apps, contacts (including dial direct), and other links directly on your homescreen. 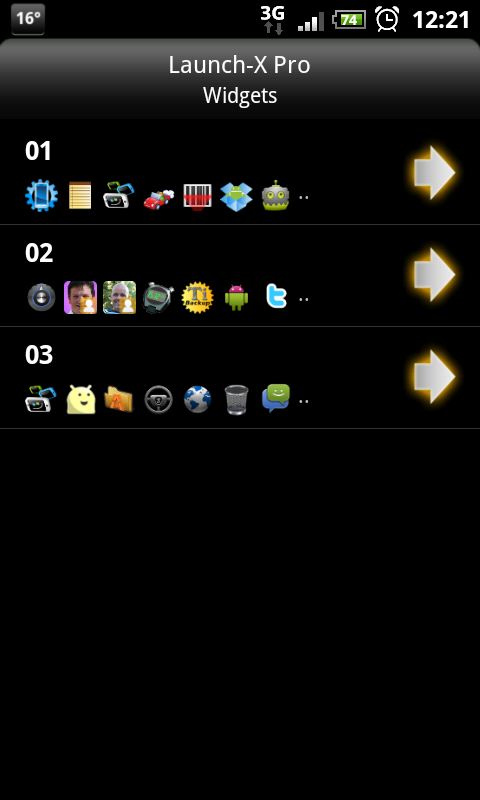 These links can be set up using "Launch-X Pro" and then displayed on the homescreen in form of widgets. In order to create a widget all you have to do is press down on your homescreen for a while. "Launch-X Pro" is mainly good for two things: it helps you save both time and space! A good design concept for your homescreen will allow you to do most actions with only a few clicks. If you happen to have more space you can – of course – use it to accommodate larger widgets. You may expect to find the following under the Screen & Controls section, but I’ve decided to include customization details in this section, too, seeing as functionality, functions, and controls are intertwined so harmoniously in this app, *sigh*. •	Scrollable widgets: you can create a scrollable and click on the checkbox if ever the widgets too large to browse through. •	You want small/medium/large sized widgets? No problemo! 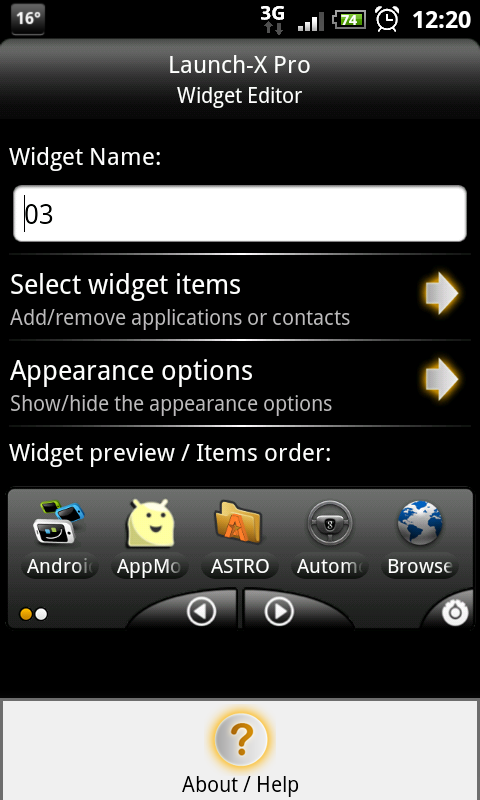 •	Up to 4, 5, 6, or 7 widgets per line? •	1, 2, 3, or 4 lines per widget? •	What should the overall look and feel of your widget be? "Launch-X Pro" comes with an option to automatically set up backups for your widgets. Go to Main Menu -> Menu -> Backup. "Launch-X Pro" is a time-saver. It lets you set your homescreen up just the way you want it. What’s so awesome about it is that it isn’t contingent on the size of your Android device—the app also helps you save homescreen space. I can’t think of any function which the developer hasn’t included—hat’s off! As mentioned above, "Launch-X Pro" packs a mighty punch when it comes to how many functions it has to offer. Sometimes too many options can become overwhelming for users, but that isn’t really the case for "Launch-X Pro". Everything has its neat little place within the menus—still, there really are A LOT of settings options to choose from. Are you looking for the save button? My biggest issue regarding controls is that when you want to save settings you always have to hit the back button. Because there are so many menus it happened to me a lot – especially in the beginning – that I accidentally wound up in the wrong menu. When I wanted to go back I was always asked whether I wanted to save changes—every single time! This feature strikes me as being fairly redundant; why not simply save changes automatically? Overall I have to say that the developer did a really good job at cramming all of the functions into the user interface. The graphic design is also very nice. That being said, considering the massive number of functions I sometimes found the app to be a bit confusing, which is why I can’t bring myself to award a full fledged five stars. On the whole the "Launch-X Pro" developers did an awesome job though and merit a nice, juicy four star rating. "Launch-X Pro" performance is great. There weren’t any crashes during testing phase. 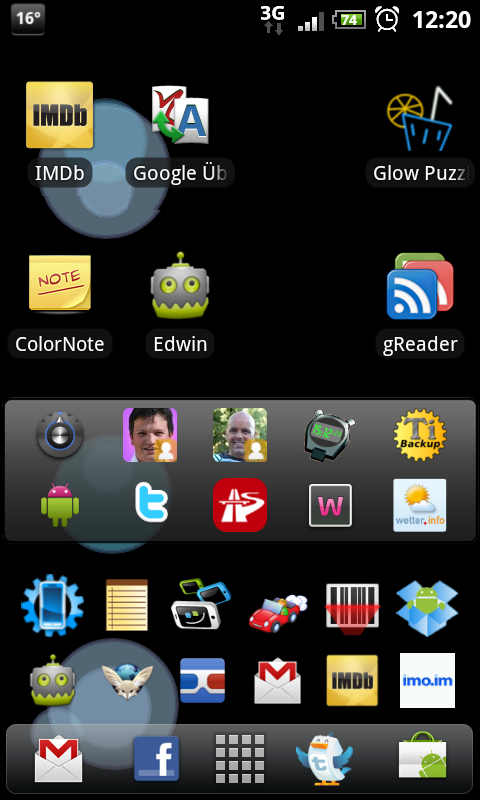 Some ROMs may experience difficulties with certain widgets. This won’t be the case when using rooted phones, though, as far as I know. The app requires 2,38 MB. App2SD isn’t supported. 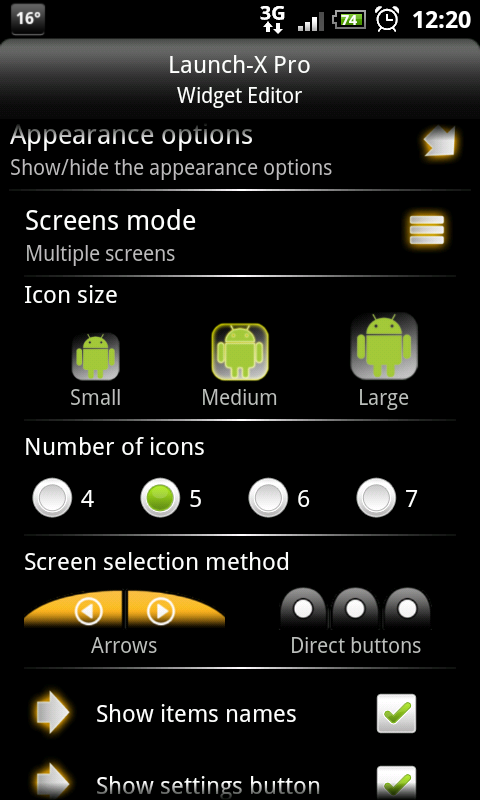 "Launch-X Pro" costs EUR 0,99 and is available both on the Market and in the AndroidPIT App Center. Love this app, works great on tablets. Great for organizing screens when you have a lot of apps. Great app! I use it for a couple of weeks now.